CHICAGO – At the start, I’ll admit to kind of hating Bob Byington’s truly unusual “Somebody Up There Likes Me,” playing this weekend at the Music Box Theatre in Chicago with local actor and “Parks and Recreation” scene-stealer Nick Offerman in attendance. It’s such a mannered, unique piece that it verges on grating. However, it slowly worked on me with its quirky sensibility to the point that some of it worked. The film never quite comes together enough to get over the sense that it’s a comedy made by people who think they’re too cool to laugh but it comes close. The abrasive Max (Keith Poulson) works at a steakhouse with Sal (Offerman) and approaches the world with the kind of deep, hipster detachment that would make Wes Anderson call him pretentious. He kind of bobs and weaves through life, barely registering any sort of human reaction to things like his wife’s infidelity, job problems, kid problems, or anything else. He is apathetic to the point of annoyance. You’ll kind of want to smack him in the face. Max asks out a co-worker named Lyla (the always-great Jess Weixler) and the two quickly get married. Everything in “Somebody Up There Likes Me” happens quickly. The piece regularly jumps forward in five-year increments but never ages any of its characters, physically, mentally, or emotionally. It’s as if Byington is suggesting a state of eternal quarter-life crisis but that might imply too much thought or definite meaning. It’s just a device in a film that’s filled with them. The very structure of “Somebody Up There Likes Me” is designed to keep the audience detached. Scenes are structured like skits or scenes in an improvisational show. No one in the real world talks like this. It’s like improv night at your favorite hipster bar. Take that as praise or damnation based on your hipster tolerance. With echoes of Wes Anderson, Todd Solondz, or the humor found on “Portlandia,” there are bound to be parts of “Love” that work. Most of them center on something that Offerman or Weixler bring to the table. A bit about striped ice cream from the former is pretty hysterical and I’m once again left wondering why Weixler doesn’t work more often. She’s charming and has pefect timing. Poulson fares less memorably but his character is designed as something of a black hole. He greets the world with a sneer and expects one in return. Recognizable faces like Marshall Bell, Megan Mullally and Kevin Corrigan pop up in cameos. To call “Somebody Up There Likes Me” an episodic comedy would be an understatement. The structure, the detached tone, the complete lack of character investment — it’s all so off-putting at first that it can be hard to get on the film’s wavelength. And then, before you know it, it’s over at a scant 76 minutes. Ultimately, Byington’s film is like four episodes of a comedy series strung together into barely a feature film. As a TV mini-series, it might have worked. As a film, it’s a near-miss. “Somebody Up There Likes Me” stars Keith Pulson, Nick Offerman, Stephanie Hunt, and Jess Weixler. It was written and directed by Bob Byington. 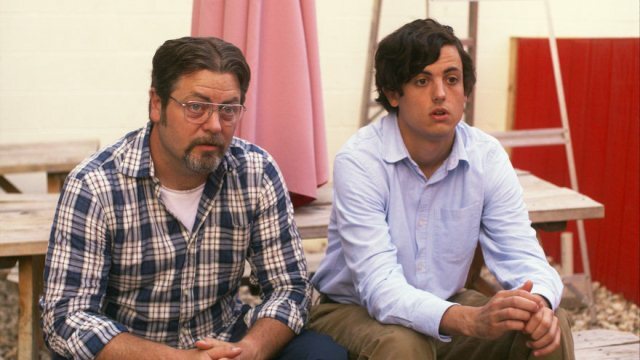 It opens at the Music Box Theatre this weekend with Nick Offerman in attendance Friday and Saturday night.